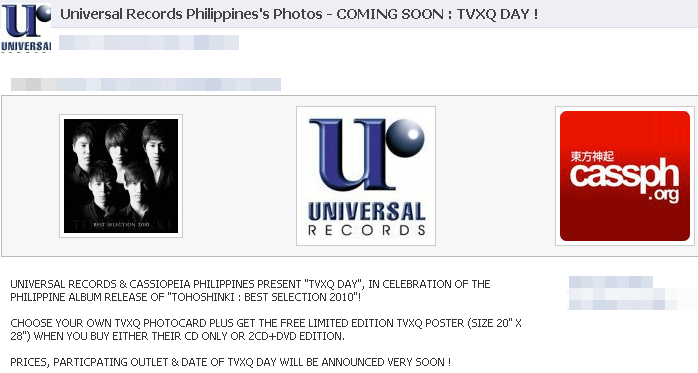 [INFO] Universal Records & CASSPH Presents “TVXQ DAY”, In Celebration Of The Phil. Album Release Of “TOHOSHINKI : BEST SELECTION 2010”! 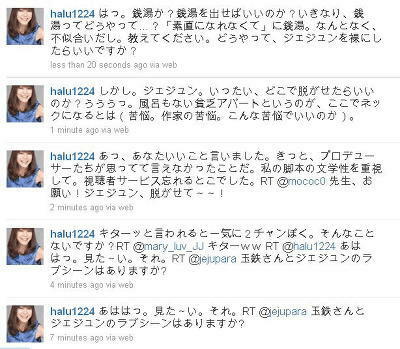 [TRANS] 100411 Eriko Kitagawa Twitter How Far Should Jejung Take It Off? Jejupara：Will Jejung and Tetsuji have romance scenes? Kitagawa：Haha, you want to watch it? Kitagawa：Ah, that’s a good thing you mentioned. The producers must have thought of this as well but didn’t say it out loud. I forgot to give the audience some benefits. Kitagawa：But, how far will Jejung take off his clothes? Having no bathroom in the poor apartment creates a hindrance. (Distressed. This is the misery that I, as a playwrite, feel. Kitagawa: Everyone’s wishful thinking has gone out of control. Right now, please write your wishful thinking here. Perhaps I could help everyone make it come true in the drama. Kitagawa：The replies are coming in with rapid momentum. Writing about handsome men like me? Kyoboo：There’s bathhouses here as well- Aoyama. It is very popular now. Kitagawa：Oh, this place is nice. Then I’ll have Sunao’s 3 men get naked here. Kitagawa：Real good. If there is time then I would actually add in the scene of the bathhouse in Aoyama. When I go on dates, I often go to these type of bathhouses. You go in separately to bathe then come out again to reconvene. A group outing is indeed not a bad idea. Clean water baths, it’s the new thing. Kitagawa： Then, when the television shows 3 men steaming in the sauna, will everyone say to the television “Kitagawa-san, thank you!”? Does Jejung have romance scenes? Could it be that there’s going to be a love scene? -ha. Bath house? (a place where you can shower/take a bath) Should I bring a bath house in? All of the sudden a bath house..how? Bath house and “Sunao ni narenakute” doesn’t match. Please tell me how can I make Jaejoong naked? Q: Teacher please! Please let Jaejoong take his clothes off—! -Ah! You said a good thing. That’s something the producers were thinking of but couldn’t say. I was about to put my thoughts as a scriptwriter and almost forgot to give service for the watchers. -When you say “kita–!”(used when you’re excited like it came! Or it’s here!) it feels like 2 channel doesn’t it? (2 channel is the main site for netizens) RT:Kita–!! RT: haha I want to see it~! RT: Is there Tamayama Tetsuji and Jaejoong love scene? Haha. I want to see it~. 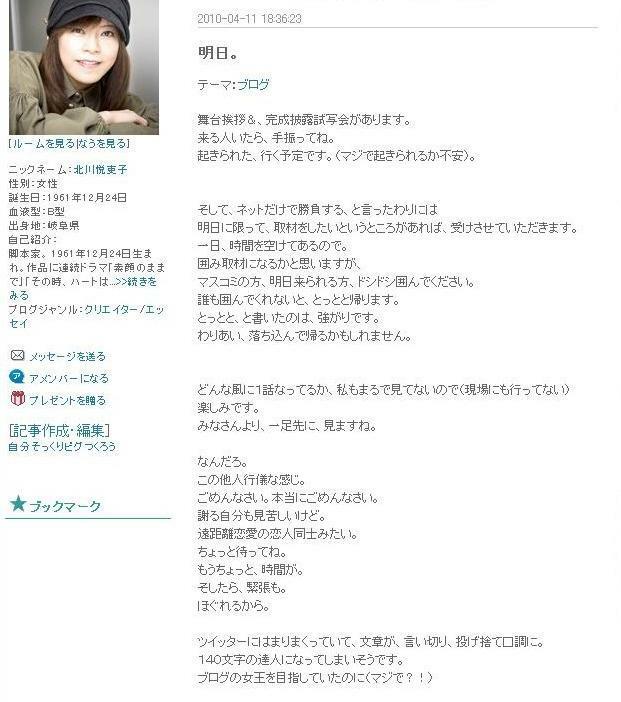 RT@jejupara is there a love scene of Tamayama Tetsuji-san and Jaejoong? I don’t have that many pictures. That’s why this will be the last one in a while. Sorry. Good night. This is YonSu who was using a hand warmer to warm himself! He only had about 5 hours of rest between the yesterday’s filming and today’s, so it’s a very hard schedule. 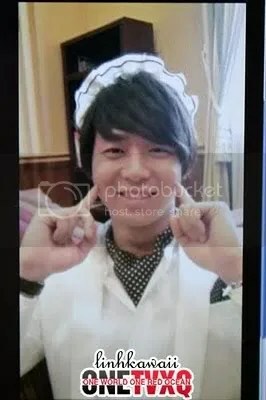 When the filming finished, YuChun said out loud, “Nochihodo (Eventually)~~~~♪” and made everyone laugh. 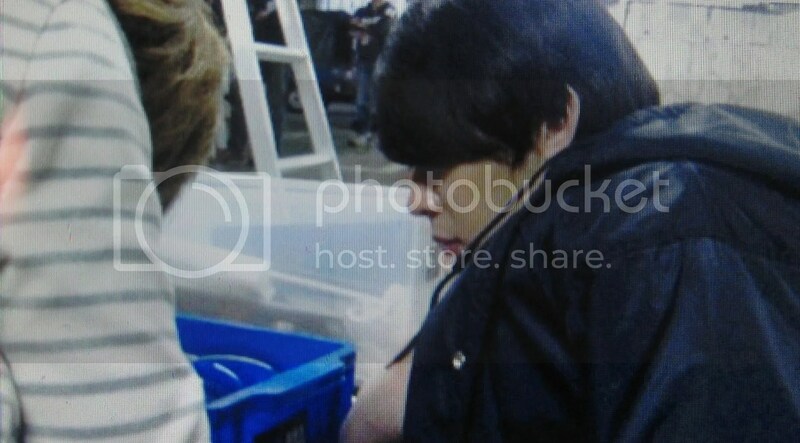 This is YuChun who had a very deep interest in watching the props being fixed. They seemed to be fixing a picture which is a very important object in the story. This is a very neat YuChun who, without thinking, folded the jacket he was holding on his hand very prettily and neatly. 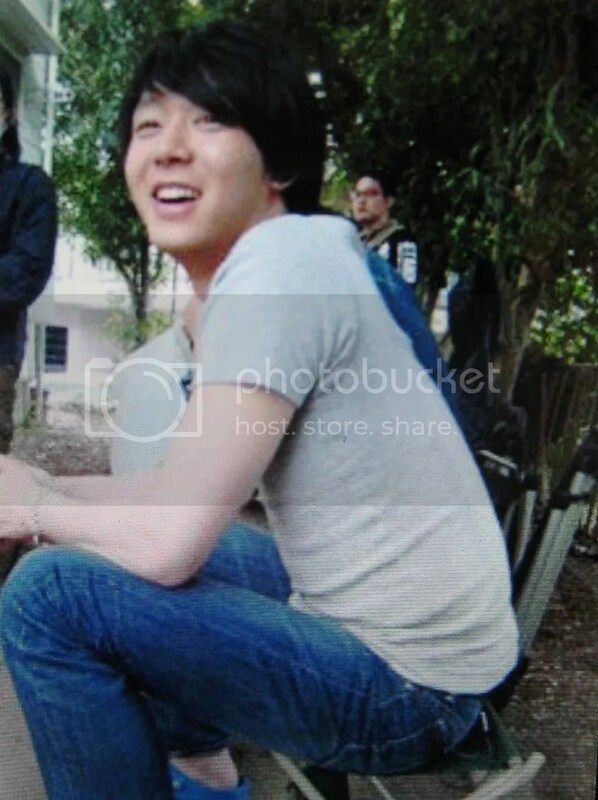 Very warm, YuChun was refreshing himself outdoor. “Japan is hotttttttt! 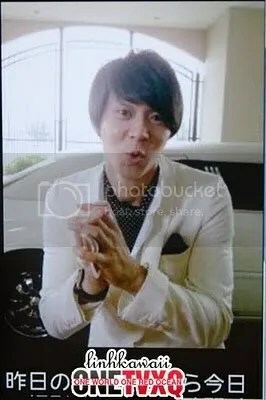 Ni Ahhhh (T/N: YuChun’s random word, doesn’t make sense)!! !” Yuchun just cried out some random words that didn’t have any meaning (LOL). YonSu who pretended he was a pillar so that he couldn’t be found!? We could totally see you from over here though (LOL). YonSu who was standing in line with the maids! For those who are coming, please wave your hands. I will directly receive the interviews, well, limited to tomorrow only. I am free all day tomorrow. I think it will be a surrounded interview. All the medias, if you are coming tomorrow, please interview me. If nobody will come near, off I go home early. “Off I go” is my talking tough. Maybe I will feel blue going home. I am looking forward to the completed works. Oh, what kind of sentences am I writing? Sorry. I am very sorry. I apologizing should look awful. It seems like long distance lovers. I need a few more minutes. Since I am on the twitter all day now, my sentences are cut short, as if it is thrown out. I will be the master of 140 characters in the near future. The words in the parentheses are like the straight man, I am a little bit sad. I seem to be a romantically challenged person. A romantically challenged girl does the funny man and straight man by herself. Oh, maybe, I am recovering. Getting the feelings? No, to say it correctly, I seem to be twitting long sentences. Maybe I cannot go back to the former myself. I want to go back. At an early date. Oh, you don’t need to hurry. Step by step. Just now, I have written these scripts. For “Sunaoni Narenakute”.